Meet the entrepreneurial nurse who found opportunity on the end of a needle. In the mid 1990s, Americans studying abroad began widening their horizons--instead of spending a semester in Florence or Paris, they were heading off to India, Thailand, Bolivia and beyond. 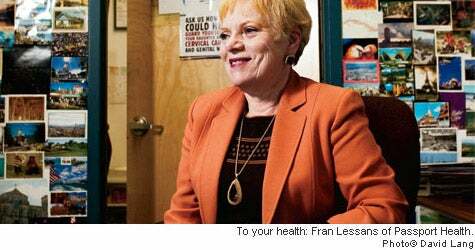 Fran Lessans, a nurse at a college health clinic in Baltimore, noticed that although students got the required travel inoculations, they were otherwise unprepared. "The health information they were getting was poor at best, so I started developing educational materials," Lessans says. "Word spread--I didn't even do any marketing--and people started coming out of the woodwork, wanting me to take care of them." That's when she got the idea to set out on her own. She partnered with a doctor, and they bought a stockpile of vaccines and set up a small, part-time clinic offering individualized travel-health advice and injections. A couple of years later, Lessans was working as a nurse at Maryland General Hospital--and getting a constant stream of requests for after-hours travel consultations. "The CEO of the hospital asked me, 'What do we have to do to keep you and your business here?'" Lessans recalls. "And I told him, 'Buy a franchise.'" He did. And now 15 years later, Passport Health has 170 clinics around the country, dispensing travel vaccines, flu shots and other therapeutic injectables such as human growth hormone and osteoporosis shots. Passport Health even trains government agencies in dispensing anthrax and smallpox vaccines. We talked to Lessans about becoming a medical entrepreneur and the changing world of travel health. A travel-medicine clinic: now that is a niche. The world is a smaller place than it was. Swine flu, anthrax, avian flu, SARS and other issues have brought vaccines to the forefront. Businesses are expanding into India and China and the developing world, and there are more people traveling, more scourges, more media attention. It's terrible to say, but when there are disasters, we do better. And I've found that a lot of people come in because they know someone who got sick abroad--if they have a cousin who went to Greece and got hepatitis, they'll make an appointment. We have doctors, nurses, nurse practitioners, people who were downsized looking for a franchise, people with medical folks in their family. A lot of our franchisees are well educated and looking for more stimulation than what an automotive or fast-food franchise can provide. There is a body of knowledge here that is ever changing and you need to stay abreast of it. You have to have a medical director involved. We're meticulous about data collection and conduct studies. This is more of a professional franchise versus a blue-collar franchise, which is good news and bad news: I can't sell to all comers, but my franchisees don't need their hand held as much. Travel medicine can be slow in the fall, but we specialize in vaccines of all kinds. We've been involved in several bioterrorism initiatives with the Department of Defense, training them on using the anthrax vaccine. In the fall, we do a lot of corporate flu and wellness contracts and have done vaccinations for T. Rowe Price, Delta Airlines and Constellation Energy. Plus we run a 24/7 call center that answers travel health questions from military personnel and Department of Defense employees. Why go to Passport Health instead of a doctor? You can call and tell us where you're going, and then do the forms online. There's no down time--you're never sitting in an exam room waiting. It's the Nordstrom approach to medicine--your time is valuable. [In Baltimore, for $48,] we give you a bound book of pertinent information and show a video about what to expect, what to eat and not eat. We teach you how to properly use bug repellent. This is our core business, and there's a lot of value because we're not stretched thin doing anything else.